Sheffield’s roofing specialists, Martin-Brooks, dug deep to ensure their heritage skills were on top form for repairs on the site of a scheduled ancient monument in Derbyshire. The firm carried out a full reroof of the former smithy at Magpie Mine in Sheldon, near Bakewell, which is widely regarded as the UK’s best example of a lead mine. Magpie Mine is an Historic England Scheduled Ancient Monument and the smithy and adjoining agent’s house are now used as Peak District Mines’ field headquarters. Open access was maintained whilst the work was underway. Chartered building surveyors, Weston Alison Wright, commissioned Martin-Brooks to carry out the refurbishment, using like-for-like materials to ensure the appearance of the building was unaltered. 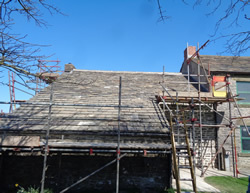 Timber repairs were made to the roof structure, before natural stone slates were laid to the rear elevation and Hardrow concrete slates to the front. A bitumen, non-breathable felt also had to be applied, due to the presence of bats. Records show lead mining has taken place on the Magpie site since 1740 and every period of working can still be traced. The smithy and agent’s house were constructed a hundred years later by famous Cornish engineer, John Taylor, who managed the mine from 1840 to 1869. The work at Magpie Mine was secured after a successful tender and took two months to complete. It was financed by Natural England’s Environmental Enhancement Scheme and overseen by Peak District Mines Historical Society, whose members provide visitor information and tours.